MINI Cooper Acccessories + MINI Cooper Parts :: OutMotoring.com MINI Blog :: MINI Accessories :: See your MINI in color! The interior of the MINI is not short on character, but some MINI owners may want to take it to the next level. 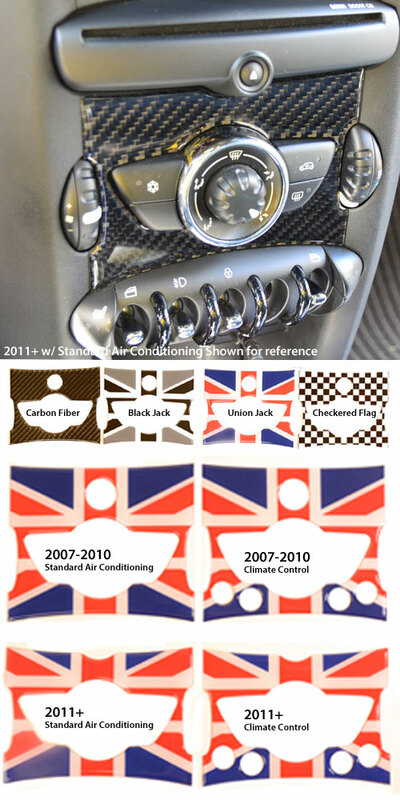 We are proud to offer this overlay that covers the plain black plastic behind the air conditioning and radio controls with a Union Jack, Checkered Flag, Carbon Fiber or Black Jack overlay. Simply install the center console accent badge in your favorite design using pre-installed double stick tape. Please confirm the correct option is selected from the drop down menu as there are 4 variations of this part AND 4 design options! MINI made a major change at the end of 2010 when they shifted the radio power button to up in the speedometer/radio housing. Also, please note differences between the Auto Climate Control AC and the Standard AC options. The Auto Climate Control AC option has 4 buttons along the bottom while the Standard AC does not. For reference, the image shown has the 2011 and newer standard AC configuration. This will NOT fit if your MINI has the Navigation option with the screen. Comments on See your MINI in color!